It is fun to buy new school supplies, such as notebooks and binders. But it is even more fun to decorate your new school supplies. If you want your notebooks, binders, and Trapper Keepers to stand out from everyone else's then you should definitely decorate them with all sort of things. Some cute design ideas are using glitter, bubble paint, duct tape, or even fabric swatches. You can really do anything, just use your creativity and your notebooks are bound to turn out just as special as you want them to be. If you are having trouble coming up with any ideas, let this page inspire you. Below you will find many cool binder and notebook decorating crafts. Have fun! This is an easy craft to decorate and customize your spiral bound notebooks or composition books or binders. Just lightly draw your design on the cover of the notebook with chalk and then glue buttons on to the cover with a strong glue (or have your parents help you with hot glue). This is easy and looks amazing! 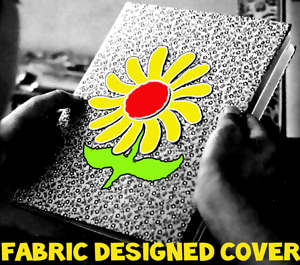 Here is a daisy of a notebook cover to be made now—used later! YOU WILL NEED: glue, fabric (large enough to cover your notebook), scissors, bits of fabric or felt in 2 or 3 colors, and a composition notebook. 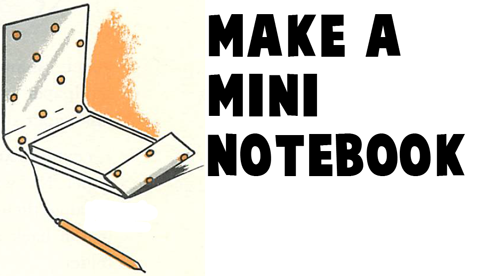 To make it, brush some glue over the notebook, then cover them with the fabric as you would with paper. Cut any simple outline you wish out of the felt or the solid fabric (a butterfly, a flower, a heart, a geometric design, etc). Then cut the small details of the object out of felt or fabric of a contrasting color (the dots for the butterfly's wings, the leaf on the apple, or the stem, the leaves and center of the flower). The best effect can be achieved with the greatest number of layers—as you add these colorful details one on top of another, you also add depth, dimension, and texture to the picture. When you've cut all the necessary pieces, glue these felt layered design elements to the front cover of the composition notebook. You will be using a book of matches for this craft so ask permission from your parents first. Remove the staples of the folder and the matches. Cover the folders inside and out with wallpaper, self-adhesive paper, wrapping paper, ribbon, cloth, or some bright-colored paint. Insert about 6 sheets of note paper, cut to about 1 1/2" x 1 3/4" and restaple. Screw a tiny eye screw into the eraser of a pencil. Then fasten to folder with a piece of string. Wrap Spiral Bound Notebooks with Decorative Paper - Decorate Spiral bound notebooks with decorative paper or wrapping paper. Rubberbands Decorated Binders - These turn out so cool - they really do. Find out how to make these binders. How to Make Designer Notepad Stationary Gift for Mom on Mother’s Day - Mother’s Day is coming up soon and it is time to think of a very special gift to make for your Mom. Here is an idea to make a designer notepad / or designer stationary present for your Mom. Moms have a lot of tasks and to-do lists to make, as well as notes to write. It seems that a designer notepad is the perfect gift to give to your special Mom. Decorate Your Binders with Yarn Art - Make your Binder or Notebook a work of art by winding yarn into beautiful art pieces.